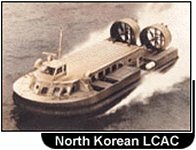 North Korea has built and operates some 130-40 Air-Cushioned Vehicles (ACV). Various versions carry 35 to 55 troops. One ACV can carry one Special Operations Force platoon for surprise landing. Designed to support mobility in mud flats, these craft are well-suited to the scenario of a surprise amphibious landings during the initial phase of a war. These amphibious craft can reach speeds up to 50 knots per hour and are hard to detect and interdict. Within a short period of time, North Korea can move approximately 7,000 maritime SOF personnel to many disbursed debarkation points along both coastlines of the ROK. Once ashore these small teams will attempt to evade CFC forces and move into CFC's rear areas and ROK population centers. 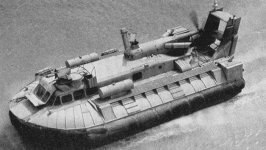 The key to CFC's success is to detect the North's maritime SOF teams early, while they are still off shore, and destroy them before they land on ROK soil.